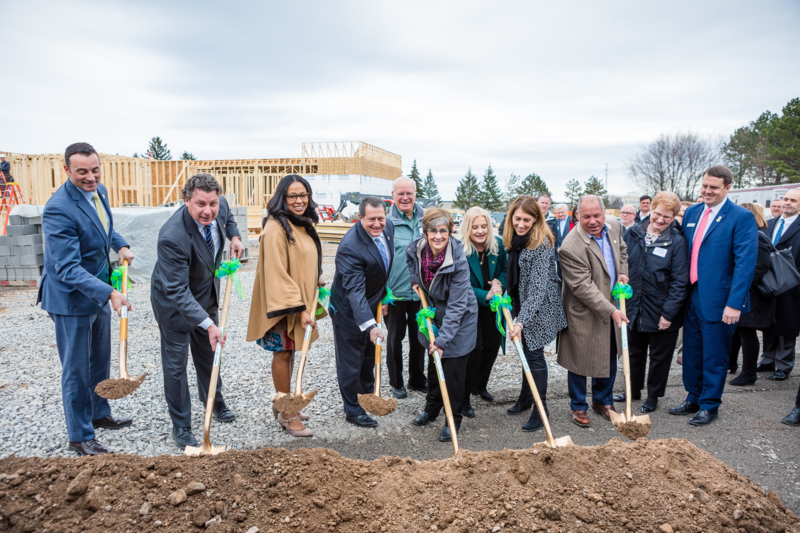 March 29, 2019, Rochester, New York: A groundbreaking for the new Golisano Autism Center (founders include Al Sigl Community of Agencies, AutismUp, and CP Rochester) and the UR Medicine’s Golisano Pediatric Behavioral Health & Wellness Building was held today from 10:30 a.m. to noon. $3 million for the Golisano Autism Center and $5 million for URMC’s Golisano Pediatric Behavioral Health & Wellness Building to launch the projects. As autism prevalence continues to rise — increasing to an estimated 1 in 59 children in 2018 per The Centers for Disease Control and Prevention — so, too, has the need for comprehensive autism-specific programs and services. Often, families living with autism also need behavioral health services. Accessing such services has been challenging as the mental health needs of our youth have also increased in recent years, and the proximity of the new centers to one another will provide efficient access to both sets of services. The Al Sigl Schwartz Family Campus is an ideal location and aligns with Al Sigl Community of Agencies’ 50-year mission to support member agencies and welcome people of all ages and abilities to learn, grow and have their needs addressed. The need for pediatric mental health services is also on the rise. UR Medicine’s Division of Child and Adolescent Psychiatry conducted 40,000 outpatient visits in 2018, up from 12,000 visits two decades ago. Mental health conditions collectively make up one of the top five disabilities in the United States, and by age 14, 50 percent of chronic mental illnesses have already begun. Suicide is the second-leading cause of death among children. The media is invited to attend the groundbreaking ceremony which will include remarks by Golisano Autism Center founding partners, the URMC and local supporters, culminating with a ceremonial moving of the dirt by individuals who will utilize services provided within. Families will be on site and available for interviews. The Golisano Autism Center is a collaborative community of providers led by founding partners Al Sigl Community of Agencies, AutismUp, and CP Rochester. The 32,000 sq. ft. building will house a multitude of supports and services for children and adults including educational, social, recreational, therapeutic, and more! The Golisano Autism Center is expected to open in September of 2019. The URMC Golisano Pediatric Behavioral Health & Wellness Building will become the new primary location for the Division of Child and Adolescent Psychiatry. The 36,000 sq. ft. building, scheduled to open in early 2020, will allow the division to create a new service line while expanding two of its major existing programs – outpatient care and partial hospitalization.